Seven SIX puppies were stolen in early December during a Craigslist transaction gone wrong in Whitcomb Court. Tion Oliver and a juvenile male have been arrested on charges related to the robbery. 3 down 3 to go. I mistaking said 7 originally when it was 6. Getting the remaining 3 home would be a nice Christmas gift for “Lucky”…. One idea– Craigs list transactions, especially of a costlier kind (car sales, etc) could be done in the parking lot of the local police station. Check with the station beforehand.. not sure how it works here in Richmond, but in smaller towns, they generally don’t mind. is he or she available for adoption? 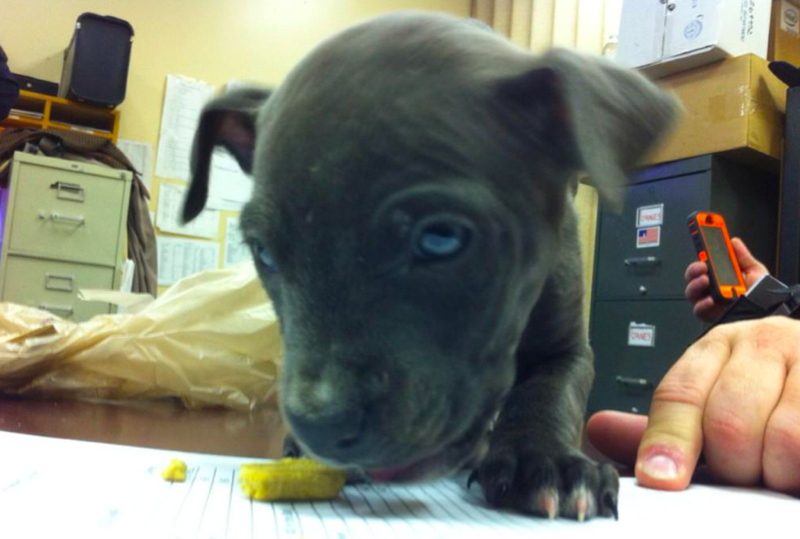 Richmond Police have arrested another man in connection with the robbery of six pit bull puppies earlier this month and have recovered a third missing puppy. Corey T. Oliver, 20, of the 3500 block of Maryland Avenue was arrested last Thursday and charged with Possession of a Firearm by a Felon and Possession of Marijuana. The arrest occurred as officers searched a residence in the 5700 block of Westower Drive and recovered a third missing puppy. Corey Oliver is the brother of Tion T. Oliver, 21, of the 3500 Maryland Avenue, who was arrested last Tuesday and charged with Robbery and Use of a Firearm in the Commission of a Felony. At approximately 4:15 p.m., Wednesday, Dec. 10, a male and two females went to the 1900 block of Chelsea Street to meet a prospective buyer of their six pit bull puppies. They had made contact with the buyer on the Craigslist website. Tion Oliver met the three, brandished a firearm and stole the puppies. Oliver fired a shot during the incident. There were no injuries. Detectives have also arrested one juvenile male in connection with the incident and recovered the first of the missing dogs at that time. He has been charged with possession of stolen property. A second dog was recovered a few days later. Detectives ask anyone with any information about the puppies still missing are asked to call First Precinct Detective Brian Taylor at (804) 646-0689 or Crime Stoppers at 780-1000. Citizens can also text Crime Stoppers at 274637, using the key word “ITip” followed by your tip. Both Crime Stoppers methods are anonymous. resident… adoption? If you are asking to do so with personal interest then you are no more the better than these thugs who tried to get over on the sellers by posting a generic name “resident” rather than your real name. That said, it melts your heart seeing and hearing the poor baby in the box in the video. Pit Bulls are not bad – people make them bad! If all you want a dog for is “status” or “image” then you don’t deserve to own one. Wrong priorities. I would adopt one myself but is bad timing with situations at home so it would not be fair to the puppy to get attached to someone who will be gone (deceased) in only a year or two and an uncertain future for myself. I do hope they find an honest and loving home. Right on Kathleen! Stop breeding your dogs & refuse to buy dogs from breeders to kill the demand. I’m sorry to hear your news, Eric.